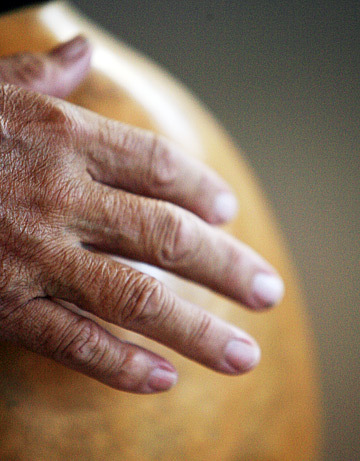 Kumu Hula John Lake's hands touched the ipu with grace and finesse during a June 8 practice. "EIA NO LA'AU MA'ANEI," sang a woman sitting on a stage during Halau Mele's weekly practice. "E kali ana i kou ho'i mai." But the people in front of her stopped dancing. Their teacher, John Lake, prodded them: "Come on, guys, you should know this. Huli (turn). Look over your shoulder." A dozen students stood in three lines staring at each other with confused looks. Then a student placed her two fists in front of her chest signaling "Here I am, right here" -- the second verse of the song "Pua Lililehua." Her classmates followed, and it jogged the memory of a second student, and she signaled the motion for the next line: "waiting for your return." Then all three lines resumed the dance. "Without me standing up to teach, they are able to teach each other," Lake said recently as he sat in the back of the classroom exhausted from dancing for an hour-and-a-half. Lake has been teaching every aspect of Hawaiian culture for decades, inspiring future generations to pass on the knowledge. Lake chanted and played the ipu as his students danced kahiko. 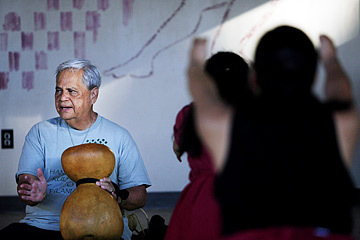 Lake teaches both native Hawaiian chant and dance at the Center for Hawaiian Studies at UH-Manoa. His commitment to teaching the community prompted many of his former students to organize a celebration July 29 at Saint Louis School for the 40th anniversary of the after-school Hawaiian club that he founded, Hui O Na Opio. Keolani Noa, one of the group's alumni who is organizing the event, said at least 300 people were expected, and she hoped the number would increase to 500 people. The celebration features dinner, a slideshow and live entertainment. "There's people coming out of the woodworks for this," said Noa. She said the celebration was for everyone influenced by Lake, not just Hui O Na Opio alumni. "This is especially important because not only is it a reunion, but a chance to see the great man and all of the lives he's touched." Lake, who was diagnosed with throat and nose cancer two years ago, said he is excited about the reunion. "It's the greatest gift a teacher could ask for. To be able to look back at all my students and see what they've accomplished," said Lake. He credits his positive outlook on life and the support of his family, friends and students for his success in battling the disease. Lake said one of his toughest struggles was that the radiation and chemotherapy treatments took away his ability to speak for two months, but that did not stop him from continuing to teach. "I did a lot of writing during that time," he said. In March, doctors removed a tumor from Lake's throat. "So far so good. The doctors are just monitoring it, but they say they don't see anything so far," said Lake. Throughout his career, Lake has taught Hawaiian culture and performed many traditional Hawaiian rituals such as blessings and marriages. One of his most prestigious responsibilities is to conduct the annual four days of rituals and ceremonies in August at the Big Island's Puukohoa Heiau, which was built for the Hawaiian war god by King Kamehameha I in 1791 before he united all of the islands. "It is not just an annual tradition, it is our chance to meet, teach and discuss contemporary issues," said Lake, the heiau's high priest. Teaching is more than a job for Lake. He sees it as a way of life and a responsibility. "I'm training the next generation to carry on the Hawaiian culture," said Lake. He has taught more than 2,000 students including kumus and celebrities such as Na Hoku Hanohano Award winners George Helm and Bobby Hall. Lake's former student Patrick Makuakane, who runs a halau in San Francisco, said, "His way of teaching is the epitome of olu olu (graceful, sweet and nurturing). I make sure I teach and approach my students in the same way." 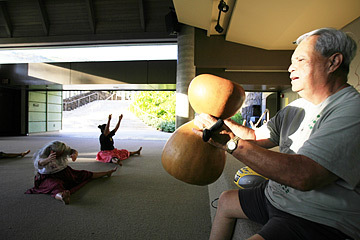 Kumu John Lake presides over his class as they stretch prior to chanting and dancing kahiko, ancient hula. Inspired by his love for languages, Lake studied Spanish linguistics at the University of Valencia and continued his educational career by teaching in the San Francisco public school system. In 1962, he became a Spanish and history teacher at Saint Louis School before he developed a Hawaiian studies course that later evolved into its own department. "While I was there, I realized the language and culture was slipping away," Lake said. "I grew up during a time when anything to do with the Hawaiian culture was not tolerated." But, he said, he was shocked when 45 of the school's football players asked him to teach them hula in 1966. "You used to be considered a sissy if you did anything artsy like dance hula. But they really wanted to learn and were willing to come after practice to do it ... It became that you were the big man on campus if you danced hula and played football," Lake said with a thunderous laugh. However, Lake was not fully convinced they were interested in learning the sacred art, so he said, "Fine, if you want to learn, you need to go out and get 45 other girls." Lake rolled his eyes and said, "Me and my big mouth." They returned the next day with dance partners and formed the basis of the after-school Hawaiian club Hui O Na Opio, which eventually attracted more than 2,000 students from Saint Louis, Saint Francis School, Sacred Hearts Academy and Star of the Sea School over the years. "It caught on like wildfire," said Lake, who has taken his students to the neighbor islands, mainland states and neighboring countries such as Canada, Mexico and Tahiti to perform over the years. "Wherever they went, they learned, experienced and shared the Hawaiian culture with others," Lake said. "I got kids to love Hawaiian; to dance and enjoy it regardless of their ethnic background." In 1974, Lake helped make it mandatory to teach Hawaiian history in public schools. One year later, he started Halau Mele, which taught everything about Hawaiian culture including hula, slack-key guitar, steel guitar, choral arranging and chanting. "Some of them (my students) have been with me for more than 23 years," Lake said. In 1993, Lake retired from Saint Louis and planned to move to the Big Island. Lake's former student Ikaika Dutro, currently the Crusaders' Hawaiian Studies department chairman, said, "It's a challenge ... He left some big shoes to fill." But Dutro still has the guidance of Lake since the kumu hula never left the campus. Neighboring Chaminade University pleaded with him to reconsider his decision to retire. Lake said, "They wouldn't let me move. They said, 'We cannot lose your expertise.'" In 1995, Chaminade hired Lake as an adjunct professor in Hawaiian language, religion and oral traditions. Seven years later, the school created a new position for Lake, kumu-in-residence, which means he is responsible for any Hawaiian matters or protocol. "It's one of the most exciting things to pass down tradition," Lake said. 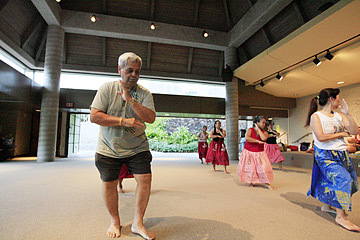 Kumu John Lake occasionally joins his students in dance. July 29: Lake's Hui O Na Opio group will celebrate its 40th anniversary with a reunion at the St. Louis Field House from 3 to 10 p.m. Tickets are $15 for adults and $10 for children. For more information call 847-3737 or e-mail huionaopio@hotmail.com. Aug. 9-13: Kumu John Lake will conduct the annual four days of rituals and ceremonies at the Big Island's Puukohoa Heiau, which was built for the Hawaiian war god by King Kamehameha I in 1791. Ongoing: Lake's Halau Mele teaches hula, chant and Hawaiian language. Classes are held Monday through Thursday at Chaminade University or University of Hawaii's Center for Hawaiian Studies. For more information contact Lake at 4999 Kahala Ave., Honolulu, HI 96816.